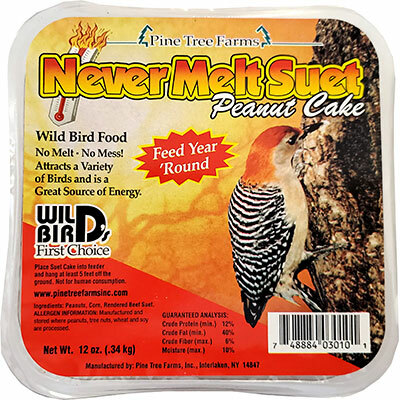 Offer suet even in the spring and summer with the Pine Tree Farms Never Melt Peanut Suet Cake. This convenient cake is specifically designed to withstand temperatures up to 120° Fahrenheit without melting, for use in warmer months. Peanuts and corn will entice the birds, and its wealth of protein helps your feathered friends stay healthy. The cake is fortified with vitamins and minerals, and fits easily into a standard suet feeder. Place several throughout your yard to enjoy birds at every turn. Feed wild birds suet all year using this Never Melt Peanut Suet Cake. Made in the USA. Note: This case pack contains 12 Pine Tree Farms Never Melt Peanut Suet Cakes.